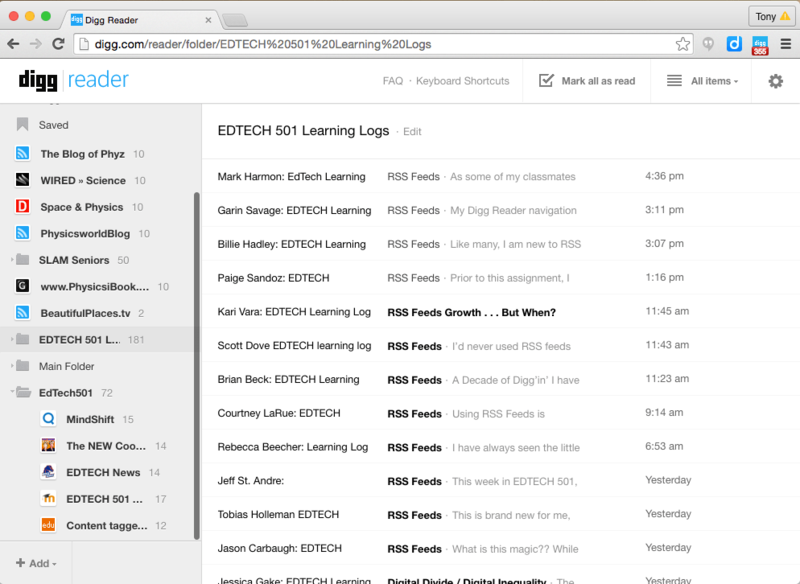 A great tool for educators and other busy people is RSS. RSS stands for Really Simple Syndication. You can keep up to date on websites and blogs that are RSS capable. It’s different than bookmarking a page. 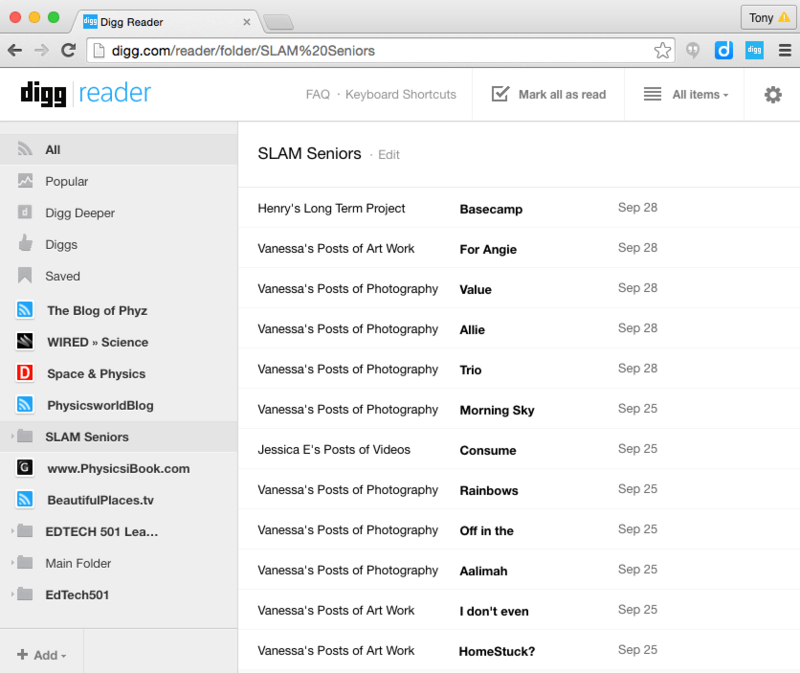 With bookmarking, you don’t know when a new post or story is added to a page. With RSS, you can see at a glance the sites that have updates and also a little blurb about what that update is. If it looks interesting you can go to the site and read the story. In my EdTech 501 class at Boise State my instructor put all of the students’ Learning Log Blogs into an OPML file. OPML stands for Outline Processor Markup Language. It’s a file used to exchange lists of web feeds like blogs. This is also a great time saver as a person can aggregate their favorite blogs on a certain topic and then share the whole list with others, saving them the time. If you go to the Settings in Digg, you can import and export OPML files. There are also settings that allow you to see how many unread posts there are. I now have 355 posts to read. I can see this could get quickly overwhelming. My students all create websites to post and show their work. We use Google Sites for our websites as my school uses Google Apps for Education. I have found that if the students create an “Assignments” page, which is a page you can post to like a blog, you can go to the page and subscribe. I instantly started adding my students to my Digg account so I could see when they updated their blogs. This may be a big time saver as I usually go to their websites individually to see if they posted their latest assignments. RSS is a great tool for keeping up with websites you like or websites that have important information, but it is also good for collecting and staying on top of changes to student sites.